At Mayhew we know that a balanced and nutritious diet is essential for the well-being of every dog. We provide the dogs in our care with a variety of foods to meet their specific requirements, whether puppies, senior dogs, or those with sensitive digestion or on a low calorie diet. 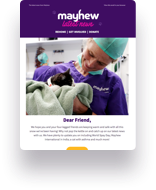 This gift could provide Mayhew dogs with two tasty meals that contain the right combination of nutrients to maintain their good health.